Smoker? Grill? The Pit Barrel Cooker defies easy categorization. Like a grill, the food cooks directly over the charcoal (with no water pan). Like a smoker, the Pit Barrel Cooker operates as a sealed system. The upright barrel shape with the fire at the bottom produces convective heat. So food smokes faster in the Pit Barrel Cooker than it would on a traditional smoker. 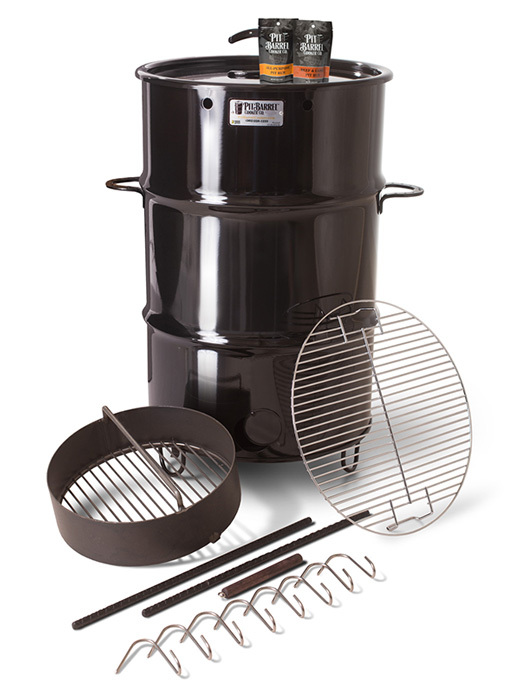 The Pit Barrel Cooker package comes with a 30-gallon porcelain-coated steel drum, stainless steel hooks, steel hanging rods, a charcoal basket, a grill grate, a wooden hook remover, and a horseshoe barrel stand. See more Pit Barrel Cooker accessories.